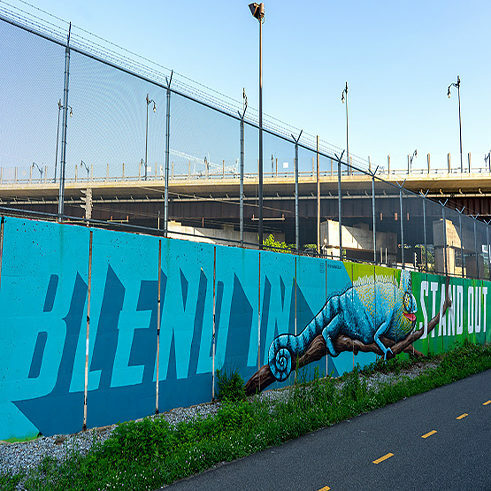 This Branch Trail mural is the work of husband and wife team, Aaron and Cassie Scales, who head the DC-based design operation BrocoLoco. Asad “ULTRA” Walker and one of the planning pages he made for his festival mural. Progress on his piece was slowed by multiple rain delays, but he has persisted in continuing his work post-festival. Martin Swift works from a photo he took three months before the festival, adding the finishing touches on this year’s mural. His neighbor on the wall, DC artist Asad “ULTRA” Walker, watches Swift as he takes a break from his own mural. Progress on the No Kings Collective mural a few days into the festival. The completed piece can now be seen at the corner of Pierce and First Streets NE. In addition to the ten artists that this year’s POW! WOW! DC Mural Festival brought to Washington from around the world, there were ten local artists who contributed works. The No Kings Collective, an ongoing collaboration between D.C. artists Brandon Hill and Peter Chang, has become known for its colorful murals and installations celebrating D.C.’s musical and cultural heritage. 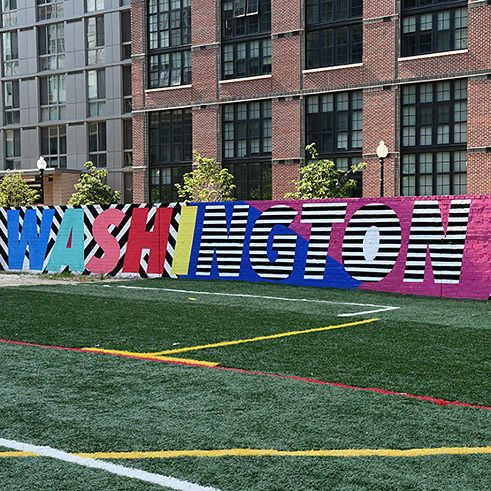 The canvas they received for this year’s festival was a long low wall stretching along a grassy lot on Pierce Street NE. The wall is not of the dimensions typically associated with murals, but the No Kings Collective made the most of it. The mix of curves, diagonals, and vibrant colors perfectly offsets the flat colors and perpendicular architecture of the building behind it. Martin Swift, a DC painter, and illustrator who, this year to do a second mural next to the popular one he did along the Metropolitan Branch Bike Trail for last year’s festival. Martin says it was fun to return to the same spot because many of the commuters and cyclists who had seen him working last year stopped to welcome him back. Last year’s piece, the first mural he has ever done, was a painting of a father and son that he knows. This year, he painted the same pair in a similar pose, but their expressions are different, and the son looks more grown up. Asad “ULTRA” Walker also participated this year, taking on the section of wall south of Swift’s section. 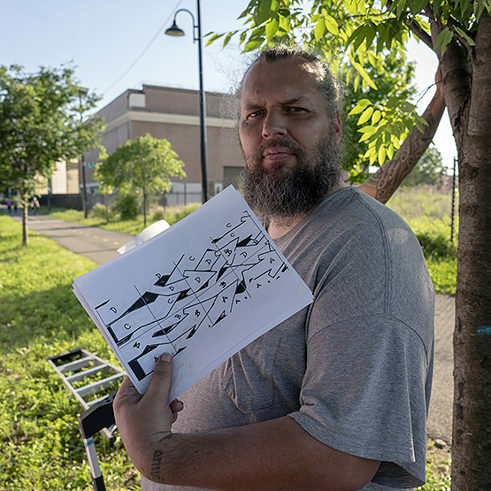 Walker is a painter and graffiti artist who has worked for years promoting street art in D.C. Another longtime advocate for the area’s art scene, muralist Juan Pineda, also painted a stretch of the Branch Trail Wall. Other wall art by Pineda, who works under the name “CRI”, can be seen around D.C. and Maryland, and he has been instrumental in the restoration and preservation of the historic “A People Without Murals is a Demuralized People” mural in Adams Morgan.